Healthline First Aid offers CPR classes in Milwaukee and across Wisconsin from expert trainers who provide answers to all of your CPR certification questions. If your question isn’t listed below and you can’t find it on our website, contact us! Everyone can learn CPR, and everyone should. Healthline First Aid has several locations throughout Milwaukee, or will come to the place of your choice for CPR training Milwaukee. Healthline First Aid is happy to travel throughout the greater Wisconsin area; offering classes in First Aid, AED, and CPR certification throughout the state, with a strong focus on Milwaukee and southeastern Wisconsin. Why do I need CPR Certification? Many occupations do require, or prefer CPR certification and training. Medical professionals to office workers can all benefit from learning proper CPR techniques, and knowing how to appropriately react in a life-threatening situation. All our classes are taught by an EMT professional with real world experience. By utilizing hands on training and easy to follow instructions, all our students graduate the class confident in their lifesaving skills. From first time students to seasoned professionals who need CPR certification renewal and re-certification; our classes provide a hands on learning experience which prepares our students for real-world emergencies. Our BLS courses for healthcare professionals cover a broad range of required lifesaving skills. In addition to basic CPR and AED training, our BLS course also teaches choking relief techniques, a basic introduction to compressions and ventilators with an advanced airway in place, bag-bask methods and the differences between rescue techniques. Our general CPR course covers the basics of first aid, basic CPR and AED training, with an optional course for infants. These classes will teach you how to safety and effectively respond to an emergency situation until the EMS responders arrive to the scene. There are many important factors which contribute to the reasons you should learn CPR. If you have any questions about the services we provide, class availability, instructors, class sizes, and depth of training received, call us today. We can teach groups of any size in a fun, relaxed environment. Our paramedics teach according to the American Heart Association standards, including use of lifesaving equipment found in public areas. Contact Healthline First Aid today to become a certified life saver with First Aid, AED, and CPR classes in Milwaukee and the greater Wisconsin area – call 414-282-4532. While it varies from state to state, the Good Samaritan law provides legal protection to individuals who give reasonable assistance to an injured person. As long as rescuers respond voluntarily, stay within the scope of his/her training and do not cause any additional harm to the victim, you will be covered under the Good Samaritan law. What Occupations Require a CPR, First Aid or AED Training? Learn more about which professions require CPR, AED, and First Aid training. What if I fail the CPR skills test? The Healthline First Aid CPR/BLS classes are taught by EMT professionals, and nearly all our students pass with no problems. If you do not pass, you may try re-taking the test up to 3 times. Can I renew my CPR certification without retaking the entire course? No. If your CPR certification has expired, you must re-take the class. The American Heart Association and the American Red Cross CPR/BLS best practices are regularly updated. Which Certification do I need: BLS Certification or CPR Certification? There is no difference between BLS (Basic Life Support) and CPR certification. There is often confusion between the two terms. BLS typically refers to Healthcare Provider CPR levels of training – hands on experience outside the normal scope of a CPR class. BLS/Healthcare Provider CPR also focus on important emergency aspects like, oxygen administration, bleeding control and splinting. 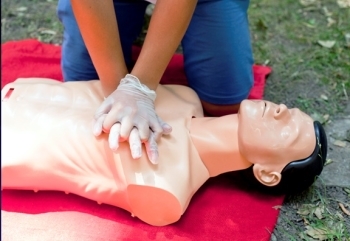 What is the difference between Healthcare Provider/BLS and Heart Saver CPR? Healthcare Provider CPR is the level of certification required by medical professionals like doctors, nurses, paramedics and Life Guards. 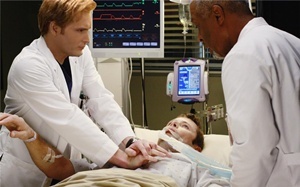 Healthcare Provider CPR focuses more on equipment commonly found in a hospital. It requires a written and skills test upon completion and carries a 2 year certification period. Heart Saver CPR is required for daycare providers, construction professionals and is useful general knowledge. It focuses on a simpler version of CPR, using equipment commonly found in public settings. There is no required written test, but students will have to pass a skills test. It also carries a 2 year certification period. Where do you offer Chicago CPR Training Courses for large groups? Our CPR training classes are offered across the Chicago area for a more expansive reach of our life-saving instruction. We provide classes in Aurora, Naperville, Joliet, Elgin, Waukegan, Cicero, Arlington Heights, Schaumburg, Evanston, and the surrounding areas. Basic life support techniques, ACLS, and AED training are all part of our comprehensive emergency response classes. Our instruction of American Heart Association CPR certification classes focuses on emergency situations which occur in daily life, ensuring Chicago area citizens are able to respond to life-threatening situations quickly and with confidence. We encourage large group participation and we are well-qualified to instruct students of all ages and backgrounds. Being proactive in your community’s health and safety is possible when you learn CPR and basic life support techniques from the experts at Healthline First Aid. If you live or work in an area surrounding Chicago, contact Healthline First Aid to schedule a group CPR training course. Is there a grace period American Heart Association certifications? Whether it is a Heartsaver CPR, BLS for Healthcare Provider, Pediatric Advanced Life Support (PALS), or Advanced Cardiac Life Support (ACLS) certification, American Heart Association certifications expire the month listed on the card with no grace period. For CPR certifications, this is not as much concern time wise because there is very little difference between the certification and recertification class. This is not the case for ACLS and PALS. In a traditional class format, ACLS and PALS certification classes are approximately 16 hours, but a traditional recertification class is eight hours. To help avoid lapses in certifications, Healthline tracks our client’s certifications, and will notify you as that date approaches. What is the passing score on the BLS for Healthcare Provider exam? The American Heart Association’s BLS for Healthcare Provider written test is 25 questions, and covers the material found in the workbook as class video. The passing score is 84%, which means a student can incorrectly answer four questions without having to retake the exam. If a student does not pass the first written exam, they are given an opportunity to retest that same class. If the second test is not passed, a separate class time needs to be rescheduled after the student has time to review the material. Find out about Wisconsin BLS training. As covered in our Wisconsin CPR certification courses, CPR stands for Cardio-Pulmonary Resuscitation. Simplified: Heart and Lung Revival. The most important thing a first responder can do is ensure the integrity of the circulatory system (heart) and respiratory system (lungs). To become informed and ready to save lives, call our Milwaukee CPR training instructors at 414-915-0702.